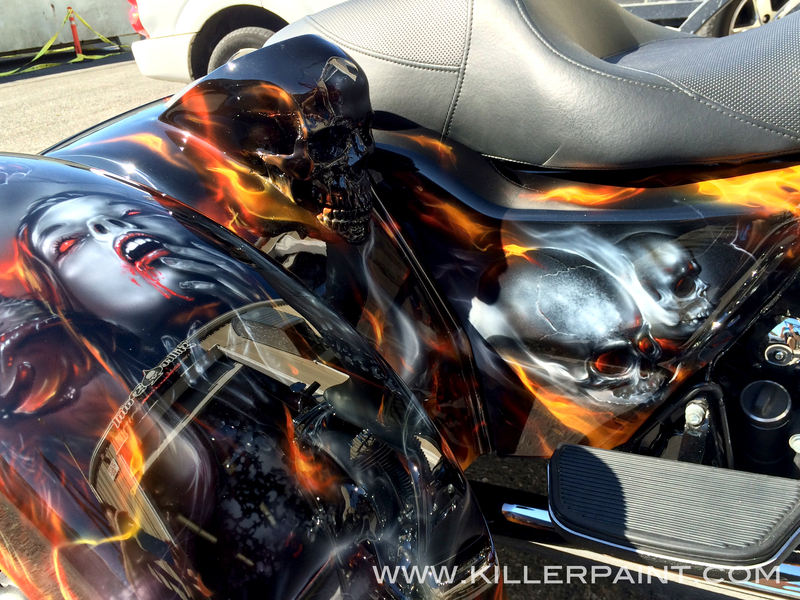 This project was just delivered to our customer, Tiffany G. She brought in her 2015 Harley-Davidson Freewheeler trike and wanted an elaborate vampire theme and some fire to go with it. A cemetery setting is the backdrop for this theme, so there are a bunch of other elements involved, working to tie the whole thing together. Tombstones and skulls and such are woven into the artwork, and lots of ominous mist snaking its way throughout the different pieces of the design along with the True Fire™. Of course, there have to be numerous bats found throughout the artwork too. Our customer wanted the vampires on her trike to be on the sensual, mysterious side of the spectrum, and not in the monstrous or gory range. So Mike made sure to keep the blood to a minimum. But still enough to make sure there is no mistake that these are vampires, despite their beauty. This project got more than just a paint upgrade, though. 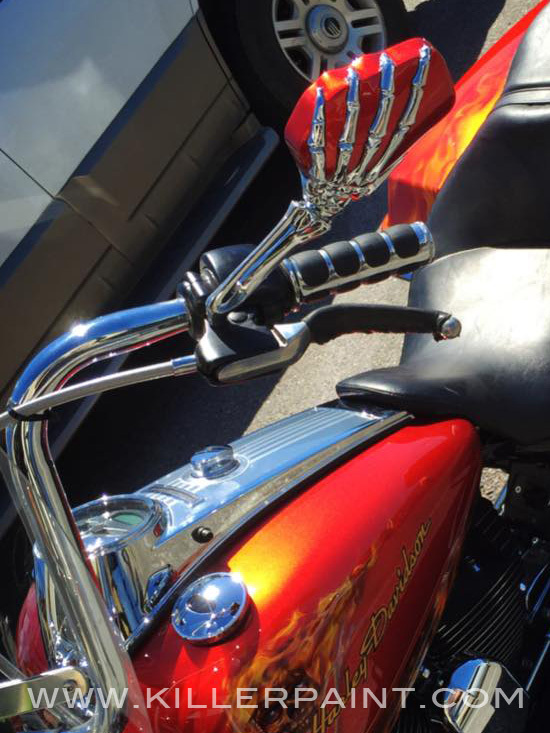 To the inside of each of the fenders, a pair of physical skulls were fabricated to partially cover and disguise the handles mounted there. Once they were made, the open-topped skulls were attached firmly to the fiberglass shell before being blended seamlessly into the body. Mike made sure that they each received some added shading and highlights so that they will both have a little bit of extra depth and pop. 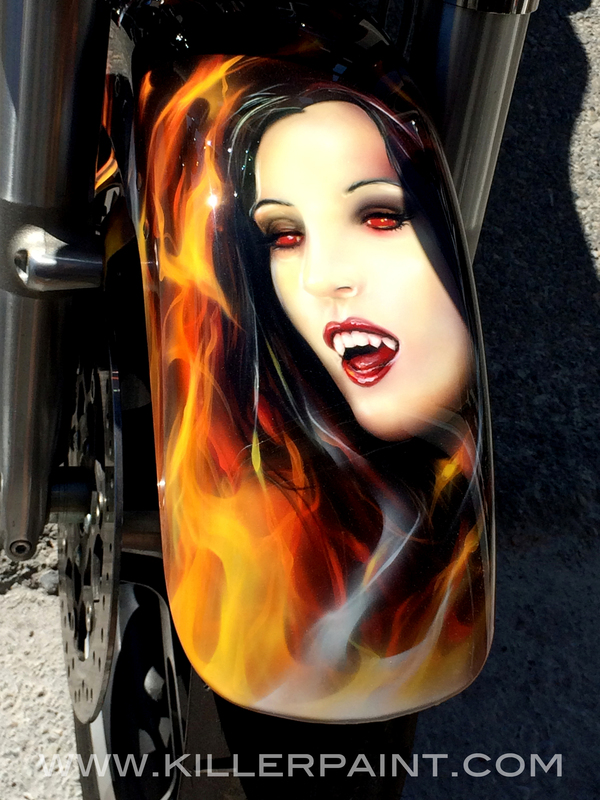 Along with the almost obligatory fire leading the front fender, there is a sultry vampiress as well, done in much more vibrant, colorful hues to stand out on the front of the trike. The rear end of the Freewheeler got something a little special. 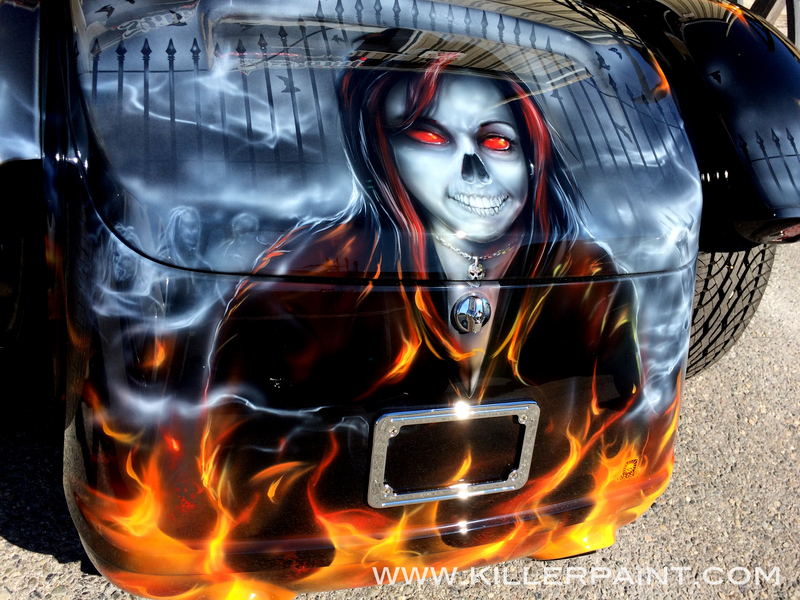 Mike painted a portrait of our customer Tiffany in his trademark Skelebrities™ style. 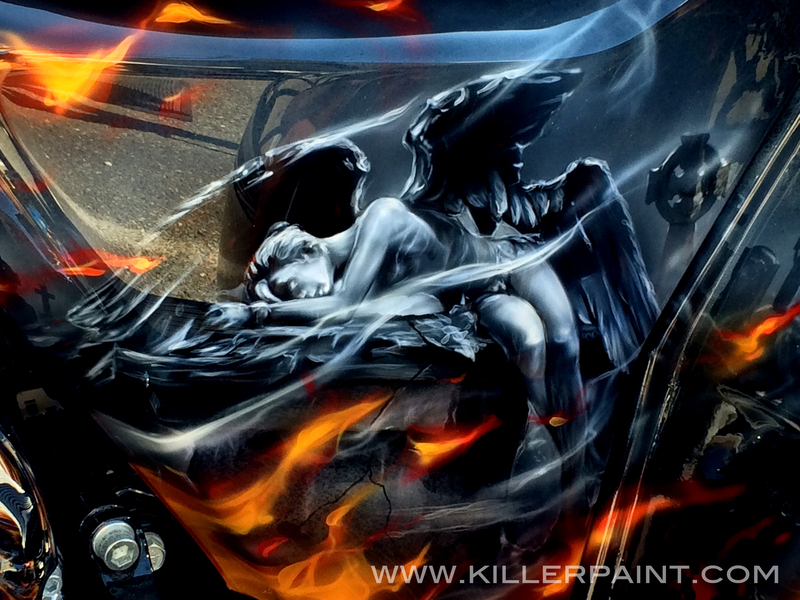 The background has a cemetery gate that carries over onto each of the fenders, while ghostly figures also lurk around in the background. We hope you enjoyed seeing how this project turned out. 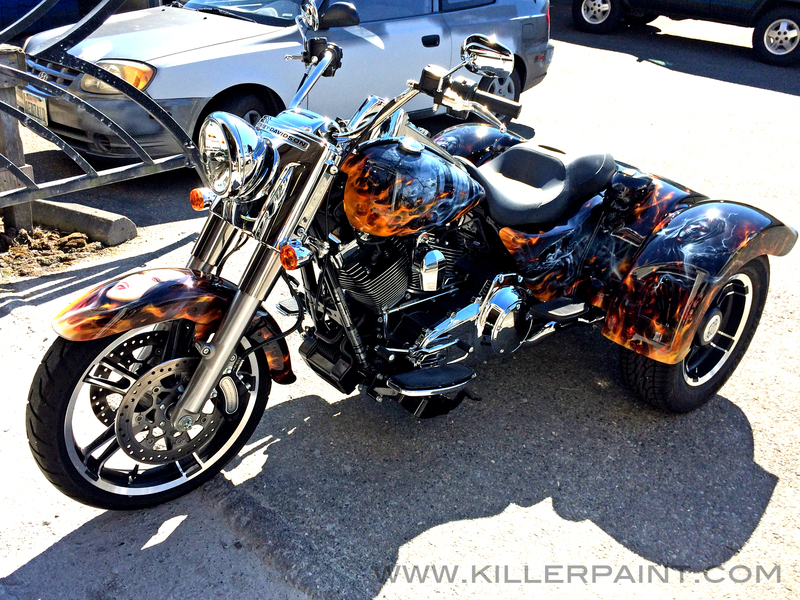 We know the owner of this unique trike sure did! Let us know if there is anything you would like to see us post here in the future! Maybe this trike gave you some ideas, or you already have an idea in mind for your own car, truck, motorcycle, etc.? 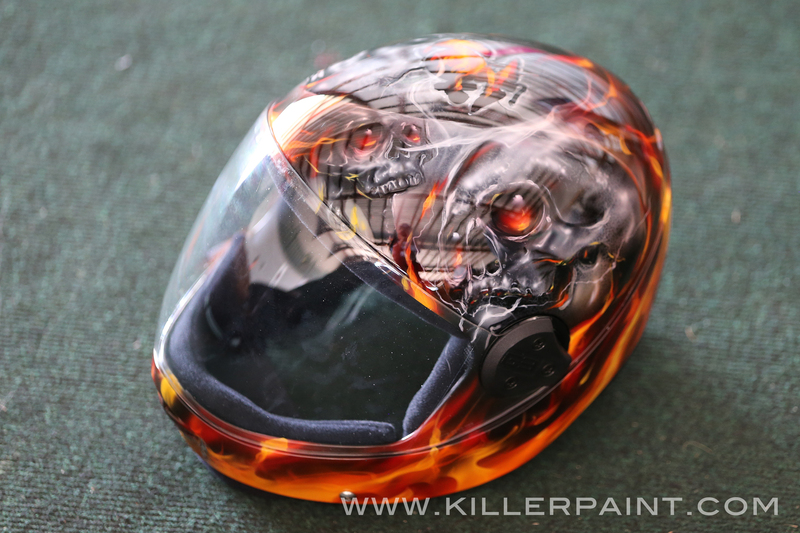 We often have people come to Killer Paint to have motorcycle helmets painted. Every so often, we get something a little different. 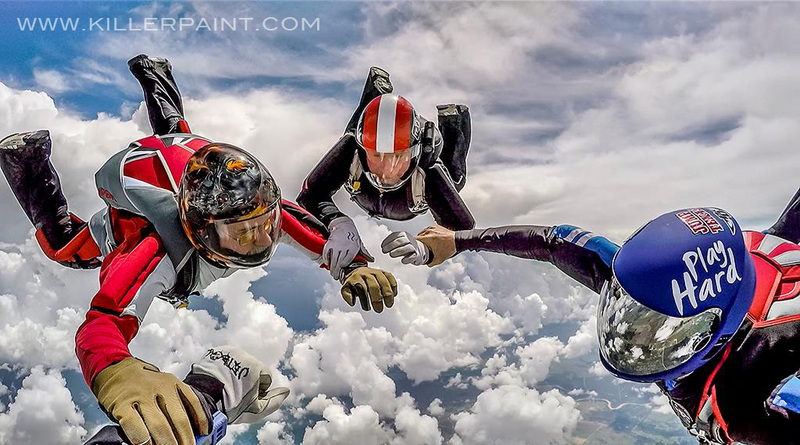 For instance, we recently completed painting a skydiving helmet for customer Jeff V.
The shape of this helmet is a bit different than your average motorcycle helmet. 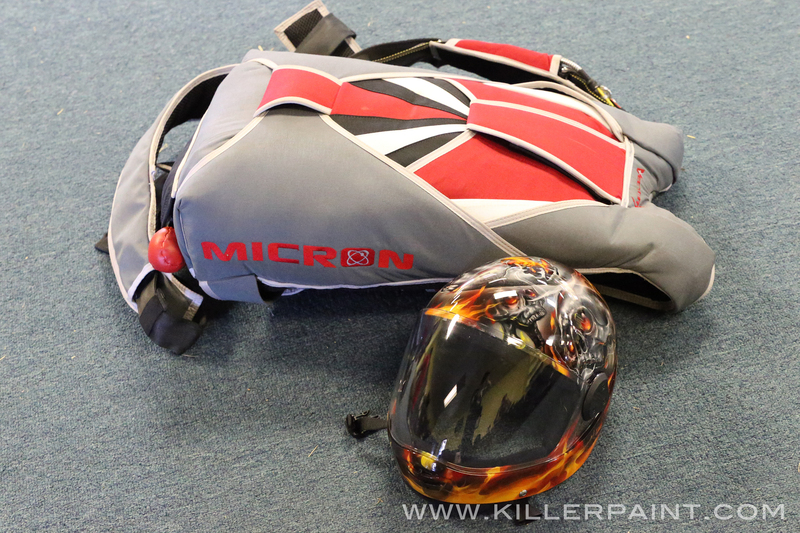 It is very compact, close fitting and aerodynamic, with a large visor. As such, there is less usable space to paint, so artwork needs to be effectively placed. 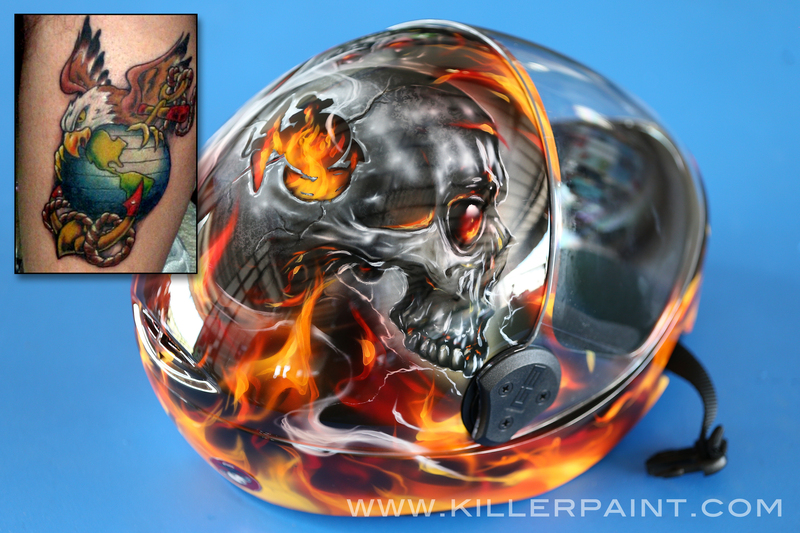 For this helmet, Mike painted some of his signature gem-eyed skulls, with plenty of fire in and around them. 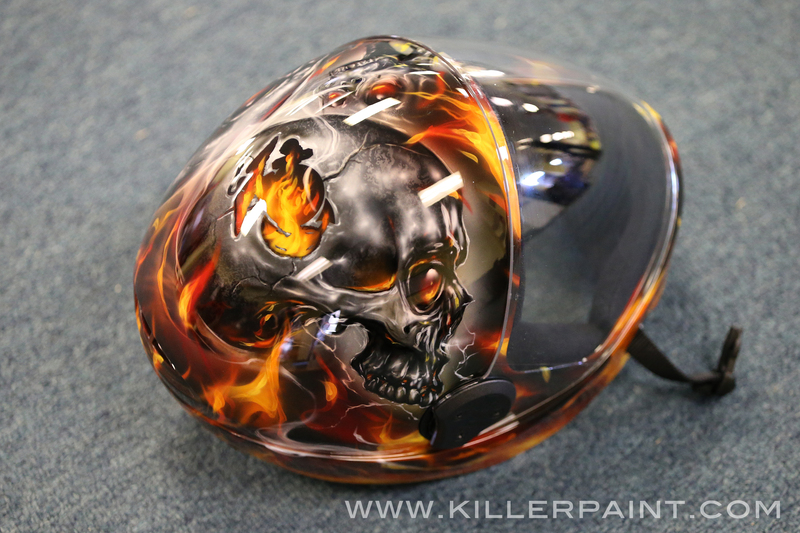 On this helmet, the cool gray of the skulls and the hot fire contrast nicely, and help the artwork stand out. Jeff has a tattoo representing his time serving with the U.S. Marines. If you look closely, the hole in the skull pictured below is in the shape of the USMC emblem as well. 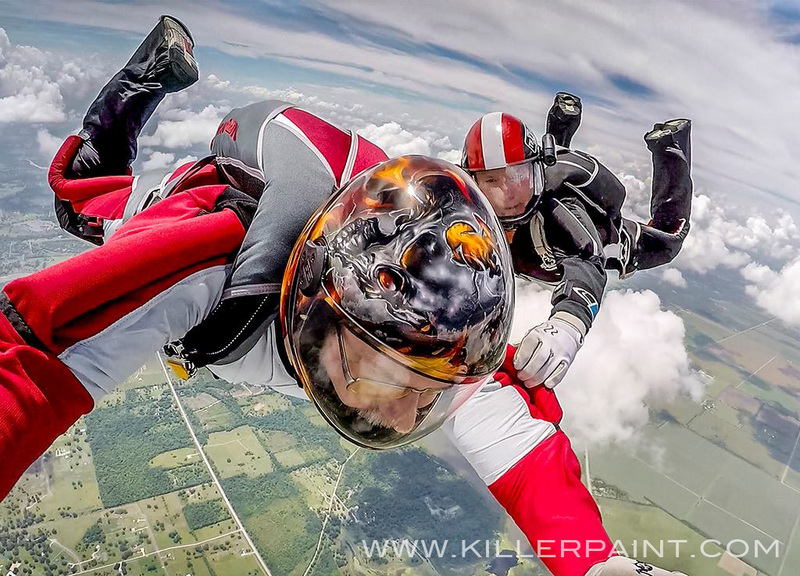 Jeff sent us some photos of himself in action, wearing the helmet. You can see how high up they are, as the clouds are below them! Maybe this project gave you some ideas, or you already have an idea in mind for your own helmet, car, truck, motorcycle, refrigerator, etc? 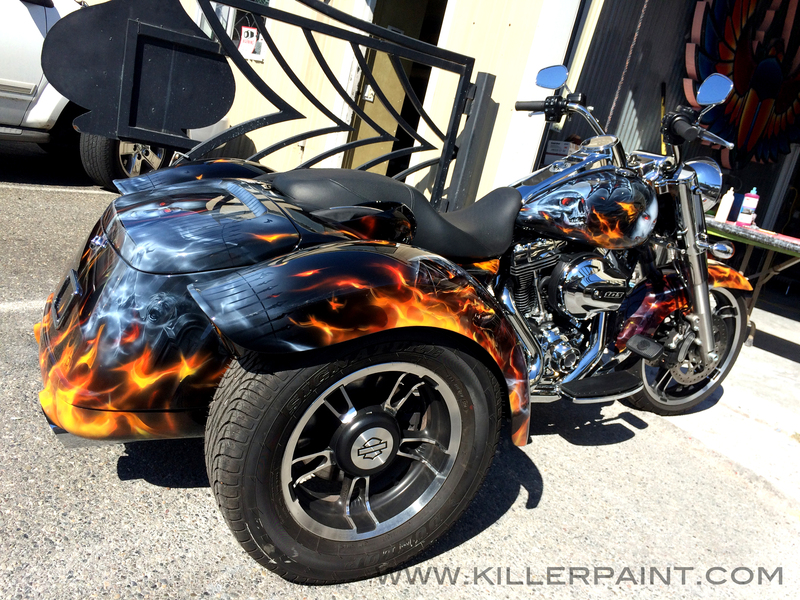 Killer Paint is often known for over-the-top paint jobs. 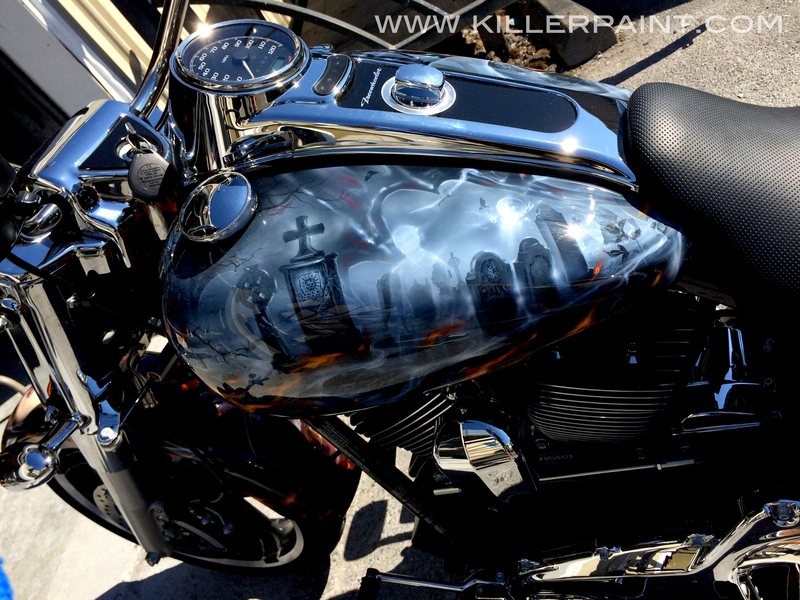 However, fantastic results can be achieved with a relatively modest amount of artwork added to an existing paint job. 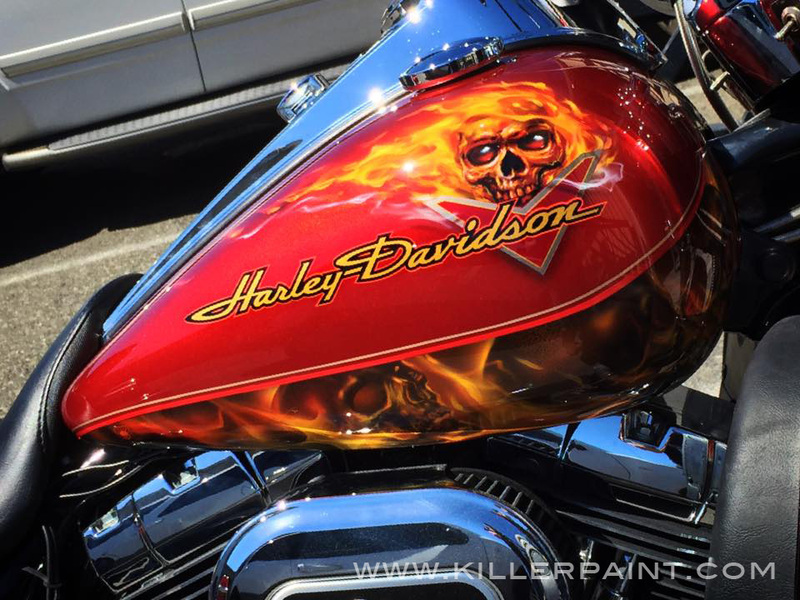 Joe B. had previously had his lower fairing add-on pieces painted for his Harley, and last month he finally decided to bring his ride back to have the rest of the bike done to match. 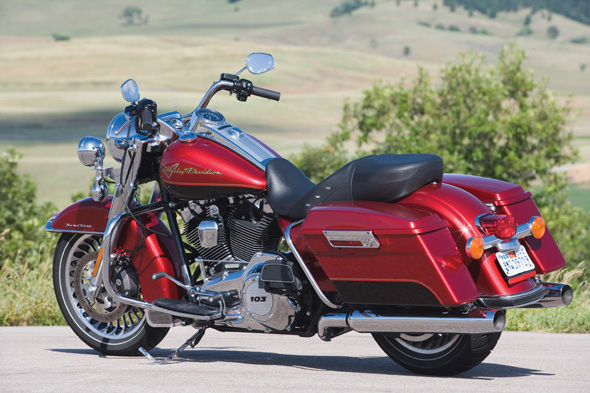 His 2012 FLHR Road King still had its stock Candy Red and Beer Bottle two-tone, similar to the bike pictured above. 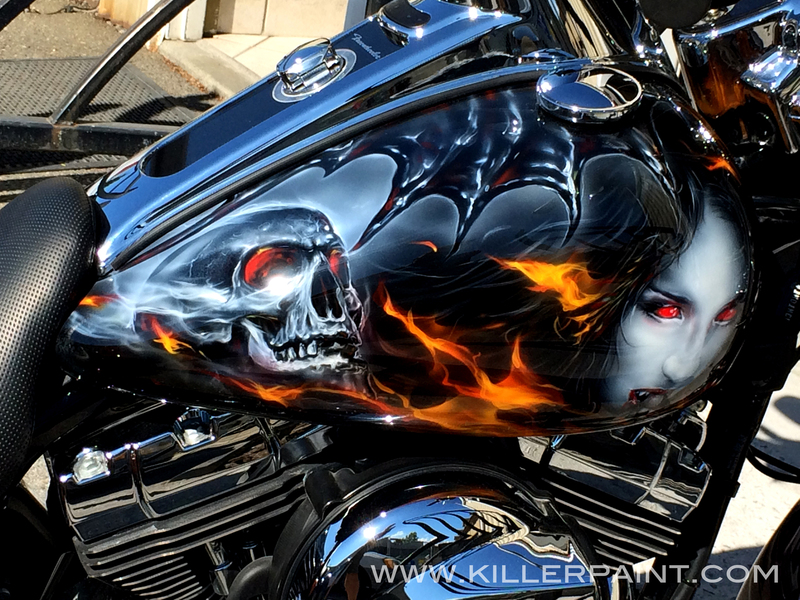 The idea was to add artwork across the bike to match the flames and skulls on the lower fairing pieces done previously, while keeping much of the feel of the stock paint design intact. 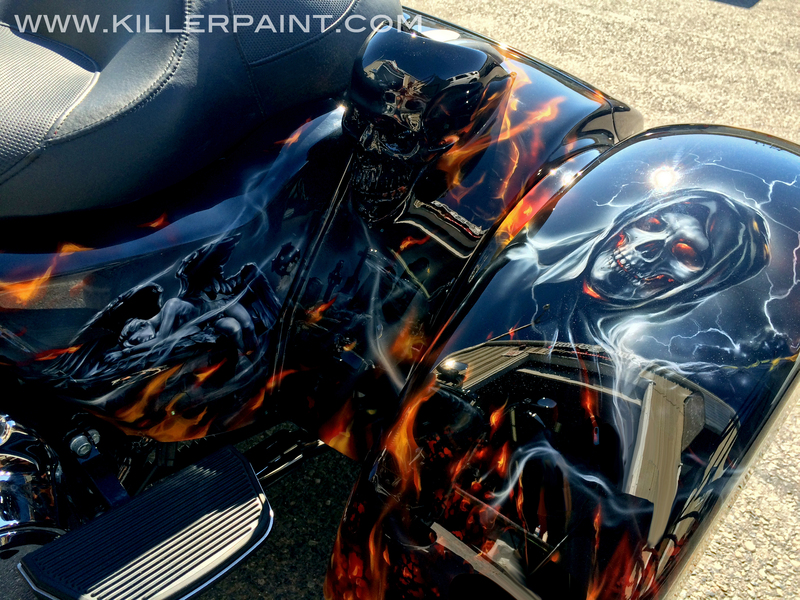 The darker sections were filled in across the whole bike with much of the artwork. In this case, the skulls and some fire. 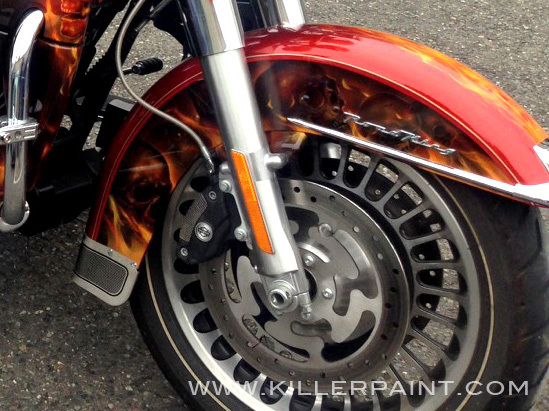 Additional flames were added in as an accent where appropriate, in the red areas on the bike. 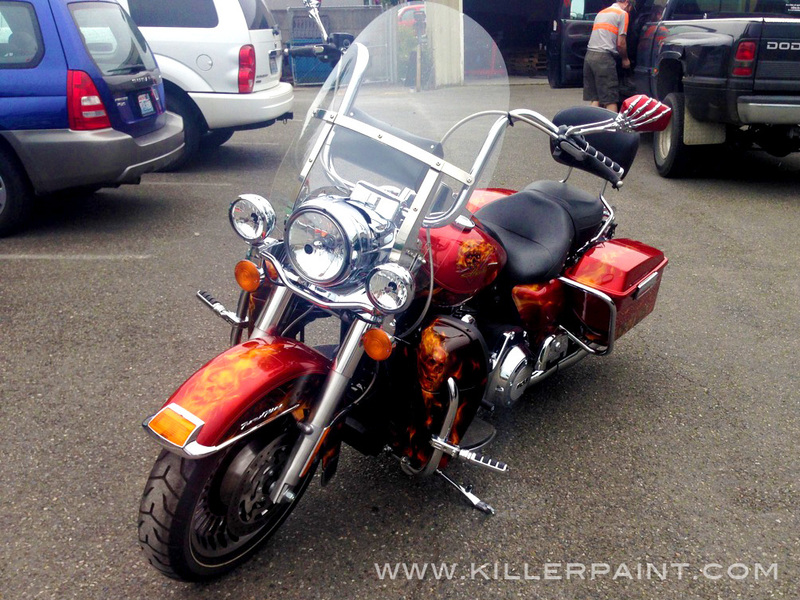 The front fender and side covers were given a Beer Bottle Brown two tone and pinstripe to match the stock paint scheme, as well as matching artwork in those areas. 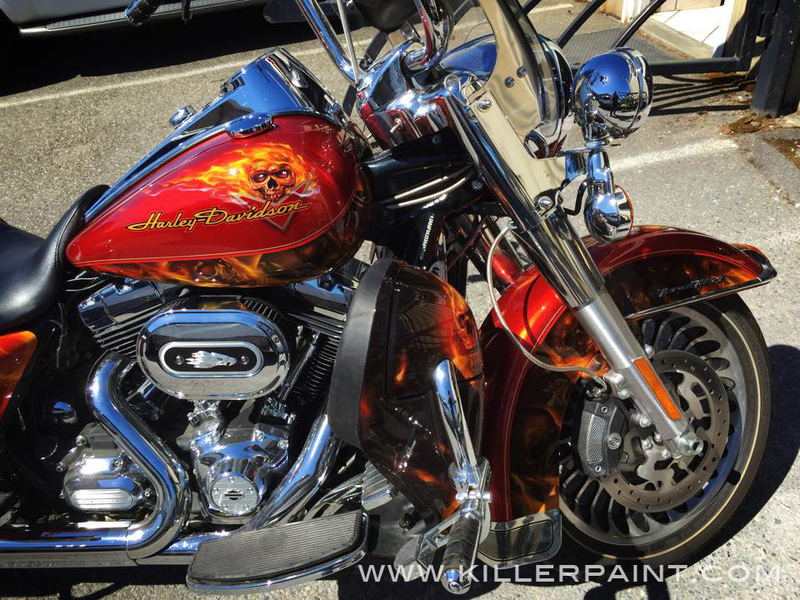 A flaming skull with smoke, with some shading for extra depth and dimension, were added to the Harley-Davidson logo on each side of the tank. 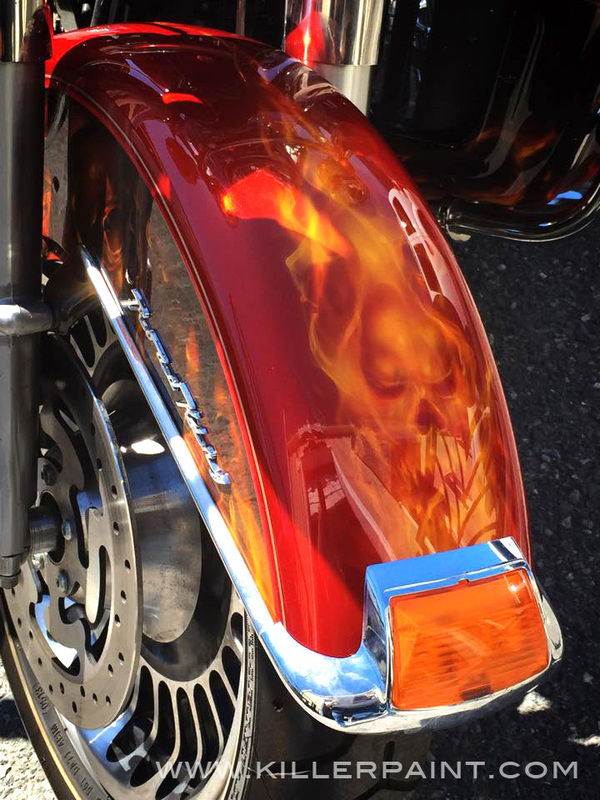 The front fender got a flaming skull as well. While the bike was still in progress, Joe brought in some skeletal rear-view mirrors that he had found. They were going to be a perfect match to his bike when once it was done. 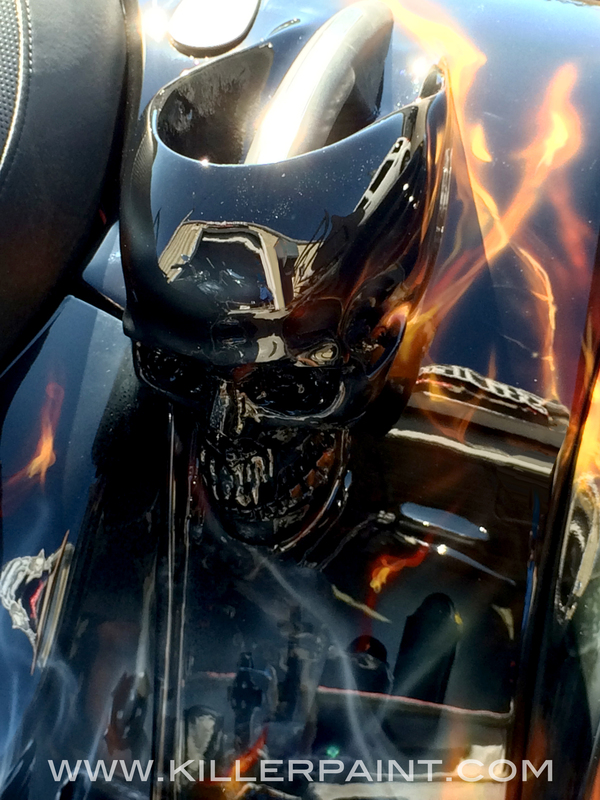 The chrome skeleton arms and hands were masked off so that the mirrors could be painted red to match. The result is an effective look. 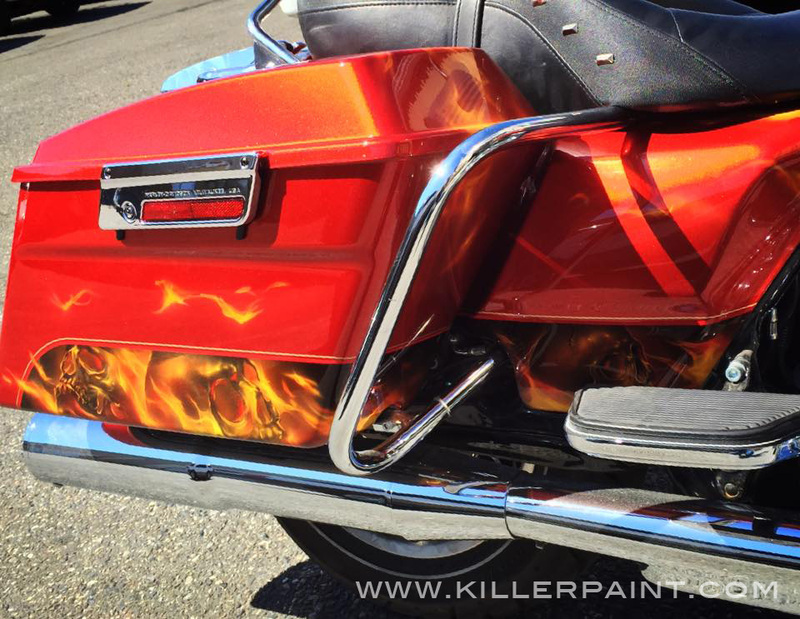 By not overloading the bike with the design and working within an existing paint scheme, you can still achieve a big impact. Wallpapering the parts with artwork is not necessarily the best approach every time. 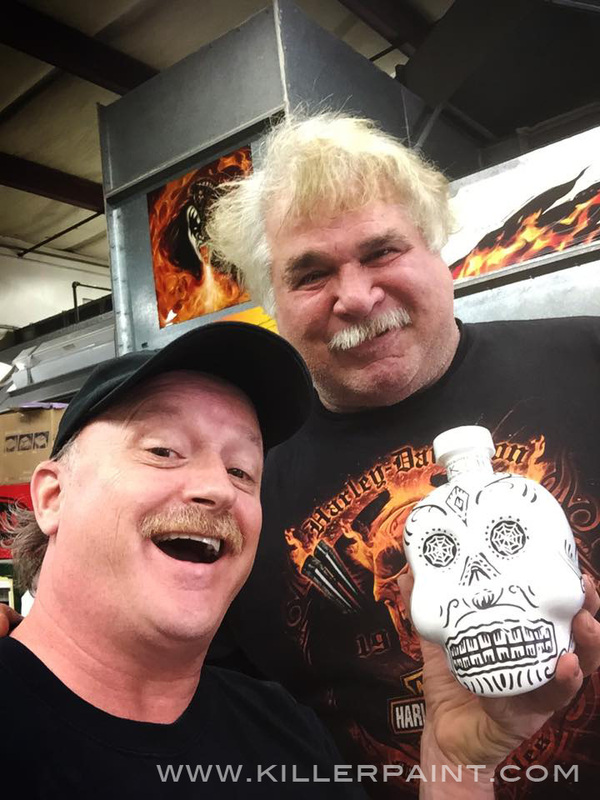 The customer definitely approved! He even brought a gift to show his appreciation.